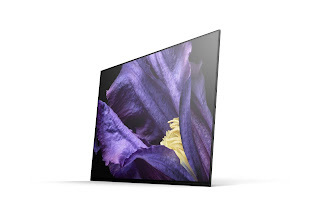 Sony announced today its new television series, the Sony BRAVIA OLED A9F. It offers unprecedented picture quality by employing multiple proprietary technologies and solutions with the next generation Picture Processor X1™ Ultimate at the fore. The new A9F series arrives as the MASTER Series – a name Sony reserves exclusively for its highest picture quality TV models. Sony’s goal is to create a television capable of displaying images that faithfully convey the creators’ full intent. The Sony BRAVIA OLED A9F provides picture quality approaching that of a professional-grade monitor in a motion picture production studio. Having developed and followed a very strict set of product evaluation criteria by its most-experienced picture quality engineers, Sony is confident that the flagship MASTER Series delivers the highest quality picture possible in a home setting. From 4K film, video and still cameras, to game consoles, mobile phones, and televisions like the MASTER Series, Sony is the only consumer electronics manufacturer capable of providing to consumers the 4K solutions of “from the lens to the living room”. The A9F MASTER Series model comes equipped with newly developed, next-generation Picture Processor X1™ Ultimate. This processor plays a vital role in delivering faithful picture on the Sony BRAVIA OLED A9F TVs. With rich history and expertise in developing professional cameras and monitors, Sony recognizes that precision in crafting fine components of signal processing results in an immediately visible difference to the whole image. The X1™ Ultimate Picture Processor can intelligently detect and analyze each object in the picture through Sony’s new Object-based Super Resolution for exceptional accuracy and detail. Also, the Object-based HDR remaster has been updated and now allows each object to be remastered individually for better depth, accurate texture, and much realistic picture. Sony has historically been working with professionals, together with Sony Pictures Entertainment – from the introduction of picture mode which meets the film creators’ criteria back in 2000 to the recent standardization of HDR, bringing them into movie creation. For MASTER series, in conjunction with Netflix, Sony is now introducing “Netflix Calibrated Mode.” This unique feature was specially developed to mirror the same picture quality as a studio evaluation master for television would. This is to preserve the artists’ creative vision and intent. By accessing one simple menu setting, the Netflix Calibrated Mode faithfully reproduces visuals that bring a story to life. Entertainment enthusiasts can now enjoy this experience when watching their favorite TV series, films, documentaries, and more on Netflix. Also, the MASTER Series is ready for CalMAN®, the industry-leading display calibration software from Portrait Displays. CalMAN is widely used by professionals as a tool to ensure quality control of the strict requirements demanded by content creators in broadcast, production, and post-production. CalMAN eliminates the struggle of maintaining the picture quality throughout the life of the TV. original panel controller for OLED. It maximizes the dynamic range by widening the area of color reproduction at high brightness. Pictures are enhanced with extra detail and texture. The Sony BRAVIA OLED A9F TV has top-of-the-line sound quality thanks to its new Acoustic Surface Audio+™ technology. Acoustic Surface™ was first introduced last year with the critically-acclaimed A1 series followed by the A8F this year. The improved Acoustic Surface Audio+™ gets an additional actuator in the center of the screen together with an extra subwoofer channel, totaling to a 3.2 channel sound system. The additional center actuator acts just like center speakers hidden behind an AT (acoustically transparent) screen which are found in movie theaters. With the three actuators and two subwoofers facing sideways, the A9F creates a rich sound field that greatly enhances the viewing experience. Also, the A9F has a TV Center Speaker Mode that allows the Acoustic Surface Audio+™ to be used as the center speaker of a home theater system. Using Android TV Hands-free Voice Search function on the Android 8.0 Oreo-equipped MASTER Series A9F will be even easier. This model has built-in microphones that allow you to simply speak to the TV to find what you want, or ask it to play TV shows, movies, and more. With Android TV Hands-free Voice Search, there’s no more complicated navigation or tiresome typing necessary. OLED as display device with Pixel Contrast Booster. 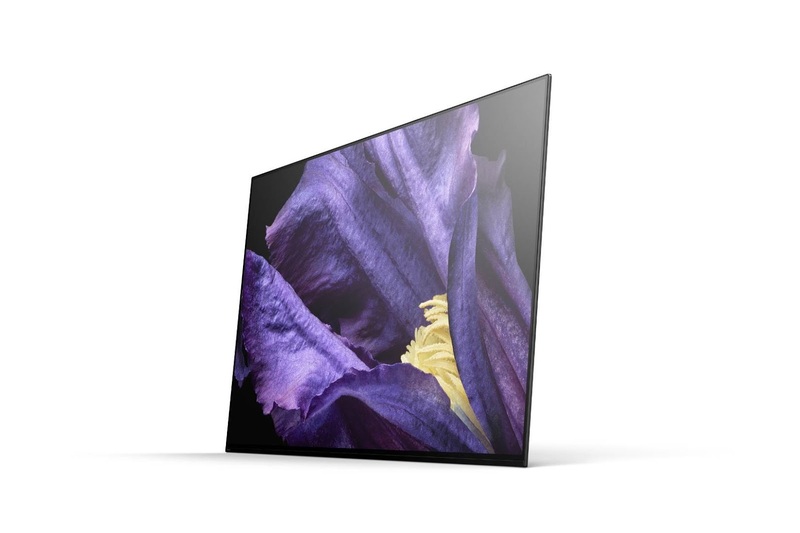 8 million self-illuminating pixels and Sony-original panel controller for OLED bring a significantly enriched visual experience with unprecedented black, authentic color, and a wide viewing angle. X1™ Ultimate provides the ultimate picture quality for 4K HDR viewing experience with the following technologies: Object-based Super Resolution, Object-based HDR remaster, Super Bit Mapping™ 4K HDR, and Dual database processing. Acoustic Surface Audio+™ creates a rich sound field delivered from three actuators and two subwoofers facing sideways, greatly enhancing the viewing experience. Netflix Calibrated Mode brings the creators’ vision directly to the TV. Vibrant, expanded color with TRILUMINOS™ Display, further enhanced for color accuracy. Android TV 8.0 Oreo Operating System includes Android TV with Hands-free Voice Search to find what you want by simply talking to the TV via built-in microphones. Ask it to help you play TV shows, movies, and more. Styled with minimalism: the screen has a single slate with only a stand in the back to hold it up. The A9F Master Series television will be available in the Philippines from September.